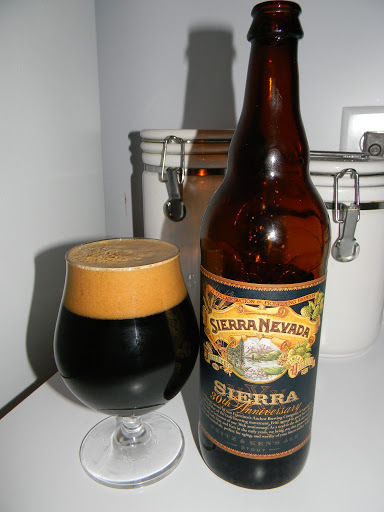 Sierra Nevada | Beer Apprentice - Craft Beer News, Reviews, Interviews and Info. What’s up folks? 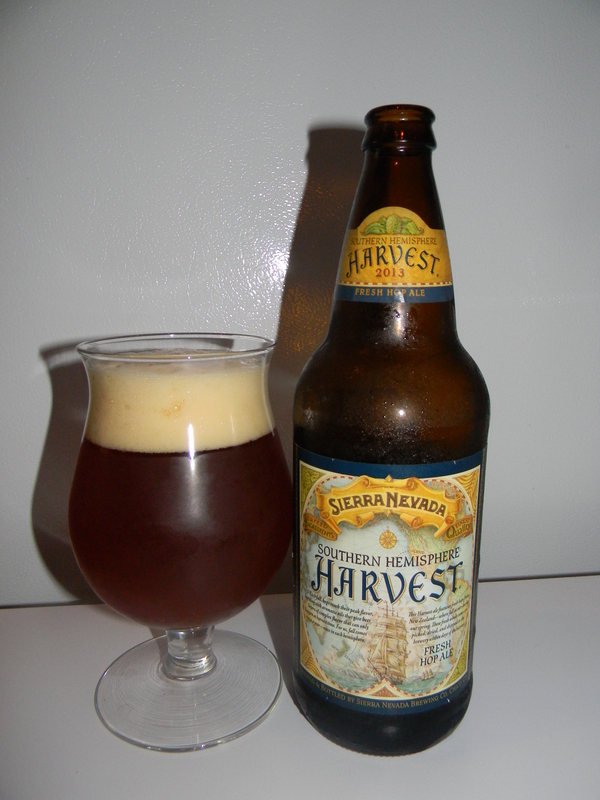 It’s time for another craft beer review and today I’m going to be trying the Southern Hemisphere Harvest brewed by the Sierra Nevada Brewing Company located in Chico, California. I’ve had these Harvest beers in the past, but it’s been a while, so I’m really looking forward to trying this one. From the website, sierranevada.com, I found this description of the beer. Featuring fresh-picked New Zealand hops, shipped straight from the Southern Hemisphere. In 2008, we launched the southern counterpart to our popular Harvest Ale, featuring fresh hops picked, dried and shipped from New Zealand within seven days of the fields. Southern Hemisphere is a south-by-north fusion that showcases the intriguing floral and herbal flavors and aromas of New Zealand-grown Southern Cross, Pacifica and Motueka hops. Sounds good enough to me. Let’s pour. This 6.7% ABV beer poured from a 25.4 oz. bottle. It discharged a dark caramel to almost amber color. The head was off white, soft, fluffy, semi-rocky and sized very well. The retention time was excellent and the lacing looked nice too. Some foam stuck around for the duration of the drink. I thought it had a somewhat muted nose. I did discover some floral tones along with a few hints of grapefruit citrus. A solid caramel malt and some herbal fragrances followed. I can’t say that I thought that the aroma was anything too outstanding, but it was balanced fairly well. The flavor was semi-bitter with undertones of caramel. Some breadiness was to be had and I also discovered some savors of a leafy nature combined with some kind of underlying spice. The hops were either a lot weaker than I remember or they had faded considerably, which surprised me because I grabbed this bottle and drank it about 2 weeks after it was released. The mouthfeel was medium bodied. It was smooth, slick and dry. The carbonation was of medium strength as well, plus an ok amount of flavor was left behind after each gulp. Well, overall I think this is a nice beer. It’s just not as potent as I remember it being. As I mentioned earlier, I think the hops were a bit subdued or something. It was a very easy drink and I’ll probably grab another bottle next year, but I doubt that I go out of my way to find it. Did you guys try this years Sierra Nevada Southern Hemisphere Harvest? What did you think about it? Feel free to leave a comment if you’d like. Hi guys. For today’s craft beer review I’m going to be opening a bottle of the Sierra Nevada 30th Anniversary Fritz & Ken’s Ale made by the Sierra Nevada Brewing Company (sierranevada.com) situated in Chico, California. These brews were released in 2010 and I’ve had the opportunity to try all of the 30th Anniversary beers in the past. This one in particular was released first. Three more followed as the year went along and I was able to set several of each aside for aging. I figured it was about time to give the Fritz & Ken’s Ale a proper review. These special brews were given their own website, sierra30.com, so let’s journey over there and see what the commercial description has to say about this one. Fritz Maytag, owner of San Francisco’s Anchor Brewing Company, is regarded as the godfather of the craft brewing movement. Fritz agreed to guest brew this very special ale with us in honor of our 30th anniversary. As a nod to the robust black ales that seduced both Fritz and Ken in the early years, we bring you this Pioneers Stout, a rich and roasted ale, perfect for aging, and worthy of your finest snifter. Enjoy! This beer came in a 25.4 oz. bottle and it contained an ABV of 9.2%. It poured to a beautiful, shimmering black color. No highlights at all shown through. The crown was khaki in color and it was exceptionally well sized. The texture was very smooth, soft and creamy. The retention time was incredible. The head hung around forever it seemed like. The lacing was thick and sticky. It left thin “sip” rings for nearly the entire drink. Simply, a gorgeous looking liquid. The bouquet was awesome. A ton of roasted malts. Hints of tobacco and “baseball glove” leather. Tones of licorice along with accents of dark chocolate and roasted coffee bean. It revealed a tiny bit of wood and it was also a wee bit charred smelling. Only a minor waft of alcohol was discovered. It wasn’t as strong as I remember, but I’m sure the age had something to do with that. The nose was complex, balanced and very well harmonized. The taste followed suit with well blended flavors of roasted and toasted malts. The bittering chocolate seemed to be a bit more prevailing than it was in the aroma. Savors of burnt toast, deep roasted coffee and semi-sweet licorice were accounted for also. Only a very minor relish of vanilla and wood were brought into being as the brew warmed and was allowed to breathe. Like the fragrance, the alcohol had really mellowed and become more congruent with the overall profile. Magnificent. The mouthfeel was full bodied. Smooth, creamy, slick, viscous, dry and chewy. The carbonation swayed toward the lower side and a suitable amount of warmth was welcomed and enjoyed. A desirable expanse of flavor was left coating the palate after each sip. Of the four 30th Anniversary beers produced, I’d say that this one was my favorite. It’s such an outstanding drink. Like I mentioned, I had a few of these when fresh, but they have really matured with time and become better in my opinion. It has gotten rid of the rough edges and evolved into a way more drinker friendly beverage. It’s dang near quaffable for such a big beer, however I’d advise that it be sipped. The 9.2% ABV could really get on top of a person quickly if they were not careful. Unfortunately, this was my last one. It’s all good though because I may still be able to run across another bottle somewhere. On a side note, I happened to email Sierra Nevada and asked how long this beer would keep before it started to loose some of its luster and the reply I received said that they would start to diminish after about three years. So, I’m guessing it’s probably peaking at the moment. If you guys have a bottle of the Sierra Nevada 30th Anniversary Fritz & Ken’s Ale that’s put aside you may want to break it out and give it a try. I think that you will really enjoy it. Be sure to tell me about your experience if you so wish. Hi guys. For today’s craft beer review I’m going to be trying the Sierra Nevada Ovila Saison produced by the Sierra Nevada Brewing Company located in Chico, California. I’ve tried and reviewed both the Ovila Dubbel and the Ovila Quad, but have yet to give this one a go. I’m a big fan of Saison/Farmhouse styled Ales, so I’m really looking forward to trying this. Let’s get to the website, ovila.com, to get the commercial description of this brew. A collaboration between Sierra Nevada Brewing Co and the monks at the Abbey of New Clairvaux, Ovila Abbey Saison brings the centuries-old monastery brewing tradition to America. 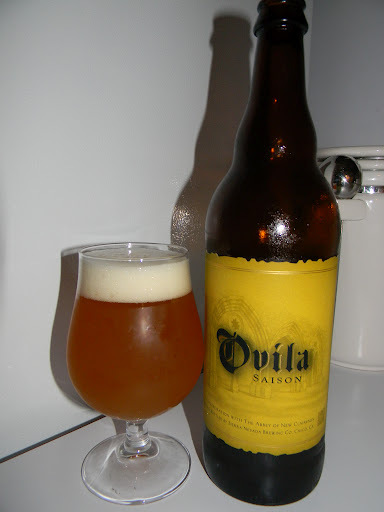 Ovila Abbey Saison is complex and contemplative-but also refreshingly dry and drinkable. With earthy and spicy aromas, this rustic Saison has note of green grass and a faint citrus tang. The body is light and layered with fruit and spice accents and a dry, peppery finish. A portion of the proceeds from this ale go toward the restoration of the historic Santa Maria de Oliva chapter house on the grounds of the Abbey of New Clairvaux. This medieval building stood for nearly eight centuries in Spain. William Randolph Hearst purchased the monastery in 1931 and planned to use the stones for a castle even grander than his famous San Simeon. Although Hearst’s plan crumbled, these historic stones will rise again in a California Cistercian abbey. This beverage comes in a 25.4 oz. bottle and it has an ABV of 7.0%. It poured a hazy orange to deep pineapple juice color. It formed a white head of good size that was smooth and soft, but a touch soapy and fizzy. The retention time seemed to be above average, however the lacing left a bit to be desired. It was thin and didn’t stick around all that long. Oh well. It presented a delicate but honorable nose of lemon citrus, grassy hops, light sourness and light floral notes. The funkiness that I was so looking forward to was very, very restrained and modest. Some peppery spices added a tickle to the nostrils and some sufficient amounts of bread came forth more as it warmed. Plus it helped pull some of the sweetness off the top. Overall, it was balanced fairly well and pleasing, although not extremely strong. The taste let loose with some befittingly tart lemon citrus. The peppery spice added some bite while the sourness and funk were kept to a minimum. Through the middle it began to get very grassy, bready, wheaty and biscuity, which I liked very well. Like the aroma, the taste had a nice floral component. No mustiness to speak of in all honesty. Quite fresh and lively. I found that the bitterness was easily managed and slight also. The mouthfeel was medium to medium/thin bodied. Smooth, but spritzy. Dry, snappy and refreshing. A very lively carbonation and a suitable amount of flavor was left behind on the palate after the sip as well. Well, I think this is an ok Saison. Although, I do think it’s probably more of an introductory Saison to tell the truth. It just doesn’t quite have that “lip puckering/nostril flaring/eye squinting” characteristic that a lot of the others out there possess. I still liked it fairly well though. It was a super easy drink and I think it would be perfect for the Spring and Summer season. If you see it, pick up a bottle and give it a try. Not to mention that some of the proceeds go to a good cause. Be sure to let me know what you think of it if you try or have tried it.